There are some words whose meaning becomes so tainted over time that they become harmful to a political cause. The left has figured this out and ditched words over the years like environmentalism, global warming and illegal immigrants. The right hasn’t yet figured out that the term “alt-right” has developed a negative connotation that is unfairly tarnishing people on the right. The term emerged several years ago to describe paleoconservatives who disagreed with mainstream conservatism. Conservative political philosopher Paul Gottfried labeled them “alternative right” in 2008. While many paleoconservatives like Pat Buchanan lamented the destruction of U.S. culture due to the lack of assimilation by immigrants, the paleoconservative movement wasn’t racist. But in 2010 William Regnery II co-opted the term. He founded a white nationalist think tank, the National Policy Institute, and started a website called “Alternative Right.” Richard Spencer, a well-known white nationalist, embraced the term and the left-leaning media raced to make him the face of the movement. Every time he held an event, they were there to breathlessly interview him. But many on the right did not realize what was subtly happening. The left had cleverly used the term to define both reasonable conservatives and racists, creating the illusion they were similar or aligned, if not the same. In reality, nothing could be farther from the truth. Racists have political views all over the spectrum. Many of them consider themselves socialists. The National Socialist Movement, which many white supremacists belong to and which may be the leading white supremacist organization in the country, calls for a livable wage, the nationalization of corporations, green energy measures, socialist healthcare reforms and the communalization of big department stores. According to the Southern Poverty Law Center, in 2009 the organization had 61 chapters in 35 states, making it the largest neo-Nazi group in the U.S.
Bannon did not realize it is too late to save the term, despite how much he wants to define it. The left-leaning media has had a field day with it, writing countless articles lumping mainstream conservative websites in with racists. They’ve successfully portrayed Richard Spencer and Breitbart as the face of the movement as if they’re one and the same. There are millions of conservatives who aren’t racist that the media characterizes as alt-right. 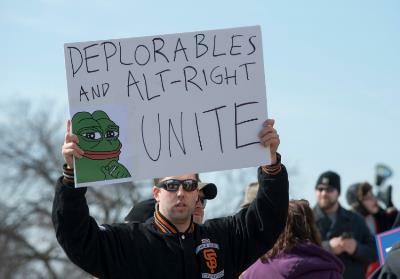 The media cleverly labels even plain old Trump supporters as alt-right. This makes no sense, considering Jesse Jackson once praised and thanked Trump for a lifetime of service to African-Americans. There are countless videos of Trump on YouTube denouncing white supremacists and racism. There are a small number of racists across the country. To lump a good portion of Americans in with a small minority of offensive people is dishonest. The left claims that white supremacists rebranded themselves as the alt-right in order to become more socially acceptable. This isn’t accurate; that small group of disreputable people isn’t powerful enough to accomplish that. The truth is the left and complicit media did it for them. It is close to what they’d like to really do, rename white supremacists “conservatives.” If the media ignored the white supremacists, they would mostly go away. It’s frustrating that the left has taken over some language. But the right has done the same thing to the left successfully. The left started using the phrase “fake news” in 2016 in a concerted effort to discredit conservative media, according to investigative journalist Sharyl Attkisson. But Donald Trump turned it around on them in a “hostile takeover” of the term. Now people associate fake news with news outlets like CNN and The New York Times. Trump co-opted the term so completely that even media which had embraced the phrase like The Washington Post has backed away from using it. Alt-right is a phrase, not a word. If the left is able to put it out of commission, it’s not a huge loss in the big picture, especially compared to the gain of losing the false racist association.